We also offer two carrying case options for the Spider Pod--The HC1 ATA-style Hard Case and the SC1 Portfolio-style Soft Case. 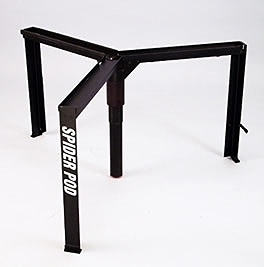 The Tripod Riser is an integral part of the Spider Support line, especially for use with the Expansion Web™ Portable Standing Platform System. When used in conjunction with the Expansion Web™, the Tripod Riser creates a stable riser to raise your camera and tripod 2 feet above a crowd. Just as important, the Tripod Riser separates your platforms from your camera, eliminating camera shake and allowing you more freedom to move, stretch and get the shots you need. As with the Spider Pod, we also offer two carrying case options for the Tripod Riser--The HC1 ATA-style Hard Case and the SC1 Portfolio-style Soft Case. The Ringo Head™ is a camera accessory that allows an operator to mount any professional video camera at 90 degrees. New production styles can require images to be captured in a vertical orientation rather than the traditional horizontal mode. This technique is often used in head-to-toe green screen, fashion shoots, and event display environments.